When it comes to dining, you know what you like – and you’d prefer to have some variety in your life. That is what we bring our independent living residents at Lake Park. 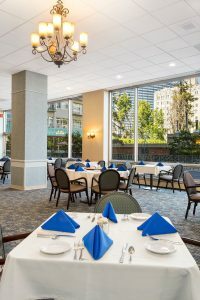 Here, you can choose from two dining venues: the main dining room or the new Rendezvous Café. 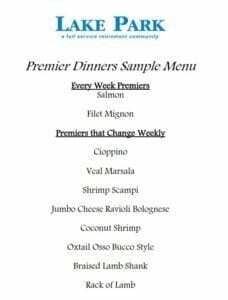 Our dining room features premiere options every day, or opt for one of the chef’s daily specials. 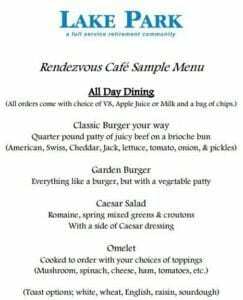 The Rendezvous Café has a wonderful selection of options – view the sample menus below to see what’s being served. Of course, any dietary requirements are happily accommodated. And if you’re hungry beyond mealtime, you’ll also be able to grab more casual offerings with our 12-hour, anytime service, from 7 am to 7 pm. 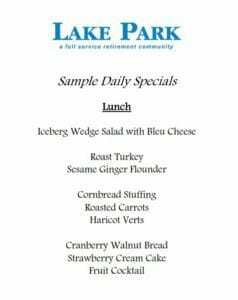 The dining within Lake Park is spectacular, but if you’d like to venture out for a meal, you’re in luck. We’re in a location where many top-notch restaurants are within just minutes. Bon appetit!